Sent to me from a Cracker Barrel in Florida. I did a bunch of interviews about the sugar industry’s funding and manipulation of research this week (see the list at the bottom of the post). I tried to point out that in the fuss over sugars vs. saturated fat, calories get forgotten. They shouldn’t be. The balance between fat and carbohydrate matters much less when calorie intake is balanced by physical activity. The Atlantic notes that Americans eat and waste vast amounts of food, using USDA data on the amount of calories made available by the food supply. Scroll all the way down to the bottom of the page to Nutrient Availability. Click on the worksheet, “Nutrients and other components of the US food supply.” Have fun checking out the trends from 1909 to 2010. We have available to us 4000 calories per day per capita. Click on the second worksheet, “US Food supply: Nutrients contributed from major food groups.” Now you can see where the calories come from: Grain products and fats and oils together account for more than 1800 of the 4000 calories in the food supply. Add in sugars and sweeteners and you are up to 2500. Meat, poultry, and fish brings it over 3000. This is why I co-authored a book on the topic: Why Calories Count: From Science to Politics. While I was in Israel last week, Time Magazine published an op-ed it had invited me to write. Here it is. Nutrition professor that I am, if I could teach just one thing to the American public, it is this: Larger portions have more calories. If we all understood this, the United States would not have an obesity problem. And the recent revelation that places like Chipotle and Panera serve meals with more calories than McDonald’s would surprise nobody. We would realize the former’s “health” aura blinds people. But this basic rule applies to those places, too. We would also, strangely, thank McDonald’s for at least one thing: It limits portion sizes. It’s easy to pile on calories by asking for a little more of this, then a refill of that—without realizing that the calories surpass those in McDonald’s meals. It’s not easy to understand calories. They are not intuitive because they’re abstract. They cannot be seen, tasted or smelled, and are extraordinarily difficult to count accurately, even for scientists. My colleague Lisa Young, author of The Portion Teller, once asked an entry-level nutrition class to guess the calories in 8-ounce and 64-ounce soft drinks. We didn’t expect students to know that an 8-ounce Coke has 100 calories—but we certainly expected them to multiply whatever they guessed by eight for the 64-ounce drink. But the average multiplier was three. The unintuitive relationship between amounts eaten and calorie intake is one of the reasons behind public health campaigns like the new soda tax in Philadelphia, which in part aims to get people to think twice before drinking sugary beverages. No nutritionist worries about an occasional 90-calorie mini-can of soda. But many people drink sugary beverages in 12-ounce, 20-ounce or liter sizes. Bigger sizes mean more calories, and more calories means more weight unless you compensate with physical activity. But exercising off calories takes a lot of work. That was the message of aNew York City health department campaign demonstrating the need to walk the three miles from Union Square to Brooklyn to compensate for the nearly 300 calories in a 20-ounce soft drink. Does where calories come from make any difference? Yes, but in complicated ways. Weight balance depends on calories. But managing weight—and overall health—very much depends on where those calories come from. It’s not so easy to overeat vegetables, fruits and whole grains, or relatively unprocessed foods of any kind, because these tend to be bulky and fill you up before you eat too much. You can still gain weight on these healthy foods, but it’s harder. Chipotle may have healthier calories than McDonald’s, but its calories still count. Sugars post particular problems because they induce insulin production, but also because they make foods taste good. We eat something sweet and want more of it. We start loving sweet tastes in infancy. Breast milk is sweet; it contains a tablespoon of lactose per cup and that’s there for a reason—to make babies do the work of nursing. But sodas are very sweet. A 12-ounce soda contains more than threetablespoons of sugars—and the calories that go with them. It’s also very hard to separate the effects of sugars from their calories. If scientists want to know whether the calories from sugars are worse than those from any other foods, they need to feed people precisely the same number of calories from diets widely varying in their content of sugar, other carbohydrates, protein, and fat for a long enough period of time to get meaningful results. The only way to do something like this would be to keep the study subjects under lock and key for as long as it takes—inconvenient, to say the least, and very expensive. Until the science is resolved, we can all agree that eating less sugar is a good idea for just about everyone. Sugars are nutritionally empty, are hidden in foods, and encourage overeating. Notice that I said less, not none. Personally, I love desserts and would never want to give up sugars entirely or ask anyone else to do so. I just follow my own dietary advice: eat lots of vegetables and other relatively unprocessed “real” foods, and for everything else, pay attention to portion size. This way, an occasional sugary treat is a pleasure and nothing to worry about. 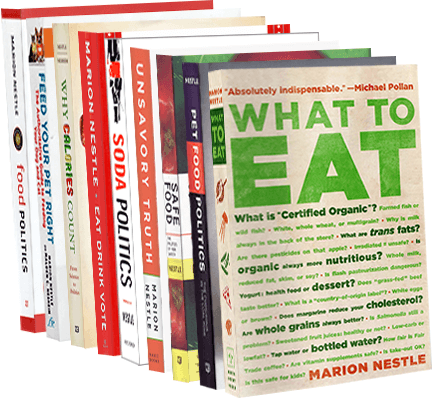 Marion Nestle is professor of nutrition, food studies, and public health at New York University and co-author of Why Calories Count. Her most recent book is Soda Politics: Taking on Big Soda (and Winning). Australian beer company says don’t worry about beer calories: be active! I’ve loved your recent blog posts on Coca Cola’s sponsorship of research that fortuitously concludes that it’s not Coke that’s making us fat, it’s lack of exercise. It’s no surprise to see that the alcohol industry here in Australia is running the same line. I just received a link to a guide to “get the facts on alcohol” Beer the beautiful truth from Lion, one of our biggest suppliers of beer. And what do you know, beer doesn’t make you fat, you just need to be more active. DOES ALCOHOL CAUSE WEIGHT GAIN? DOES BEER MAKE ME FAT? It’s not the alcohol per se that causes weight gain. Eating or drinking more calories/kilojoules (energy) than you burn, from any food or drink, can contribute to weight gain. It is important to balance the calories we eat and drink with those we burn through physical activity and basic functioning like breathing and sleeping. If you do drink, it’s important to know the calories in alcohol mainly come from the alcohol content, as well as the carbohydrate and sugars content. For example, a low strength beer will typically have less calories than a full strength beer. So really, it comes down to how much and what type of alcohol you have and what you eat with it – the chips, the kebab. Plus how active you are. Hey. If this strategy works for Coca-Cola…. This is the latest in a series of Q & A’s written by Kerry Trueman. It appeared on Civil Eats, August 12, 2015. And please note references added at the end. Civil Eats: Your next book, Soda Politics: Taking on Big Soda (and Winning), documents the history of how this sugary beverage gave rise to some of our most powerful corporations and has lately become Public Enemy Number One in the war on obesity. With sales on the decline, the New York Times recently reported that Coca-Cola is pouring millions of dollars into a ‘science-based’ campaign to convince the public that the secret to achieving and maintaining a healthy weight is not avoiding excess calories, but getting more exercise. What’s the science on more exercise versus fewer calories? Marion Nestle: When it comes to studies about the health effects of sugary drinks, the science, alas, depends on who pays for it. Studies paid for by government or private health foundations show that if you want to prevent obesity, [a combination of] eating less and moving more works every time. You can lose weight by eating less on its own. But you will have a much harder time doing that by increasing physical activity. This is because it takes lots of effort to compensate for excess calories. Eat two little Oreo cookies—100 calories—and you have to walk a mile to work them off. Drink a 20-ounce soda and you need to cover nearly three miles. This was the point of the New York City health department’s subway current poster campaign, which shows that you need to walk from Union Square in Manhattan to downtown Brooklyn to burn off 275 calories. The soda industry would love you to believe that the principal cause of obesity is lack of physical activity, and they put tons of money into research to discourage other ideas. They much prefer you to believe that all of their products can be part of an active, healthy lifestyle that includes balanced diets, proper hydration, and regular physical activity. I call the idea the “physical activity diversion.” It deflects attention from what really counts in obesity prevention: not eating huge amounts of junk foods, snack foods, and sodas. Mind you, I’m greatly in favor of physical activity for its many benefits: physiological, social, psychological, and health. But there is a good reason for the outraged reaction to Coca-Cola’s video seemingly suggesting that all you have to do to burn off the 140 “happy calories” in a 12-ounce soft drink is to laugh out loud for 75 seconds. This is so far from the reality of calorie balance that several countries actually banned the commercial [in 2013]. Soda companies promote the primacy of physical activity in other clever ways. The Coca-Cola Foundation says that about one-third of its philanthropic contributions go to organizations working to counter obesity, especially through promotion of physical activity. Both Coca-Cola and PepsiCo invest heavily in sponsorship of international sports teams. They put fortunes into recruiting sports celebrities as spokespersons. These investments accomplish two purposes: they influence fans to buy the products and shift the focus to physical activity. Obesity, these imply, is about what you do, not what you eat or drink. Public health advocates complain about how frequently young people—especially those of color or in low-income families—are exposed to advertising by professional athletes. The sponsored programs and celebrities never suggest that drinking less soda might be a useful health-promotion strategy. As a nutritionist and co-author of a book titled Why Calories Count, I thoroughly agree that balance, variety, and moderation are fundamental principles of healthful diets, and that weight gain is a result of calorie imbalance. But soda companies distort these principles to distract from their marketing of sugary drinks and how overconsumption of these drinks overrides normal physiological controls of hunger and satiety. Independently funded research makes it abundantly clear that avoiding sodas is one of the best things you can do for your health. Sponsorship of research or research investigators by Coca-Cola or the American Beverage Association is reason alone for skepticism. References: I am grateful to Richard Cooper for forwarding his paper on the relative contributions to obesity of diet and exercise. From his review of the literature, you must reduce calories to lose weight. He also pointed me to rebuttals by Blair and Hill, the investigators featured in the New York Times article cited above. The rebuttal by Steven Blair and colleagues. Funding: Drs. Blair, Archer, and Hand are funded via unrestricted research grants from The Coca-Cola Company for analyses of dietary trends and for an energy balance study. Conflict of interest: J.H. receives research grants from the American Beverage Association and serves on advisory boards for McDonalds, General Mills and McCormicks. J.P. receives research funding from the American Beverage Association.